Nothing quite imparts the same intensity of spice flavour as a well mixed and applied spice rub. We are participating in a ‘Downton Abbey’ inspired picnic tomorrow. There are promises of clotted cream, scones, crustless cucumber and jam sandwiches, homemade ginger ale, and of course, Pimms No. 1. As a nod to the British colonization of India, I have decided to contribute tandoori chicken skewers, homemade mango chutney and some decidedly British smoked salmon and dill rosettes. The rub has a distinct Indian flair and creates an intense red ‘bark’ due to the paprika and crumbled saffron threads. The smell transports me back to my staple Indian haunt, the East India Company. 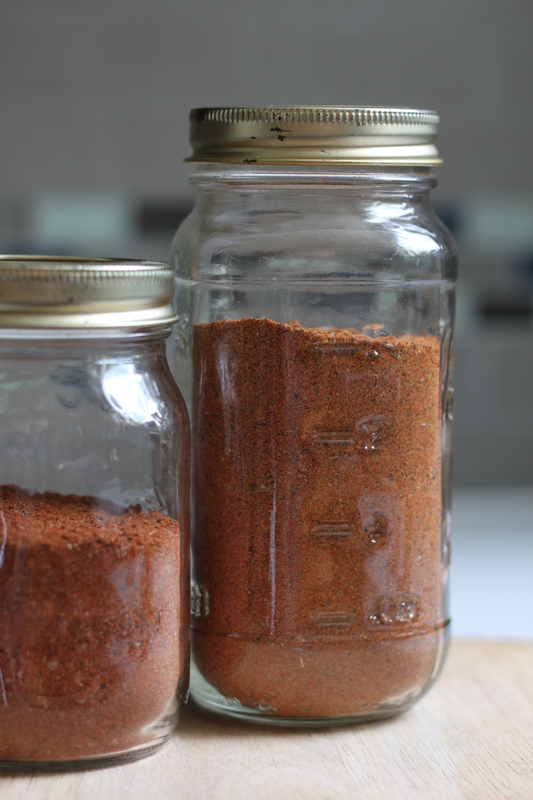 Also, while I was mixing up the spices, I decided I would prepare the ‘best rib rub’ a friend passed along – the Bone Dust BBQ spice. I received it last year but was pleased to be reminded of its smoky, yet balanced flavours. It works well when liberally rubbed directly on ribs cooked over rinsed sauerkraut. Prepare for Nirvana!